Turtle / Tortoise Garden Sculpture...is it a turtle or a tortoise??? Henry Dupere Tortoise/Turtle Garden Sculpture...The tortoise, or land turtle, like their marine cousins the sea turtle, are shielded from predators by a shell & are generally reclusive & shy. The turtle is one of the oldest known reptile groups dating back 215 million years ago! A bit of trivia-turtle or tortoise? American English tends to use the word turtle for all species regardless of habitat, although tortoise may be used as a more precise term for any land dwelling species. This long-awaited turtle is one of the more recent additions to the Henry Dupere collection!!! 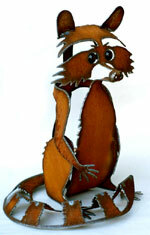 A must-have for the Dupere collector, be it in the garden or indoors. 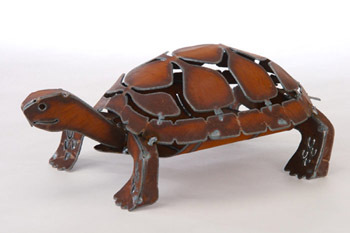 Henry Dupere Tortoise/Turtle Rusted Metal Garden Sculpture. Large: 19" long by 12" wide. Three-dimensional rusted metal turtle / tortoise garden sculpture.